Becoming a gunsmith can allow you to use your enthusiasm for firearms to build a successful business and provide a good income for yourself. You can do this part-time from your home or full-time from a separate location. This career field is as flexible as you need it to be, so you can make it fit your needs. The following are a few concerns you should keep in mind when pursuing a career in gunsmithing. Anyone can pick up a copy of the NRA's latest magazine and think they are a gunsmithing expert. However, it's not that simple. There are actually courses that you can take in-person or online that will teach you all of the ins and outs of gunsmithing. The right education is key to make sure you are doing the right thing with each weapon you work with. There are many gunsmithing courses offered through the NRA and even local colleges. Find one that fits your schedule and budget. It's also important to have the proper tools to do the work you are undertaking. This will ensure that the work is done the right way, and you don't cause harm to any firearms you are entrusted with. This will also keep your customers safe and help you build a solid client base. There are a lot of safety issues involved with gunsmithing. If you don't do the work properly, you can cause serious injury or death to yourself, your customers or innocent bystanders. Make sure you do the proper research and understand the firearms that you are working on. Don't take on jobs that you can't handle, or work on weapons that you aren't familiar with. Safety should always be your number one priority. 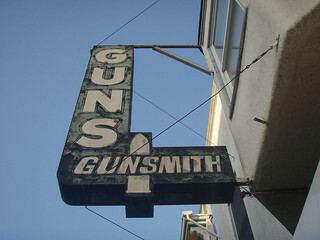 Most states don't require a license to become a gunsmith. However, you may need a business license to operate. If you plan to purchase weapons, you will likely need a Federal Firearms License. There may be other licensing requirements based upon local regulations. Check into these things before you set up shop. This will save you time and can possibly save you from being fined by the government. You also need to keep your marketing plan in mind. If you are doing this on a part-time basis, word of mouth may be all you need to build a successful business. If your plan is for gunsmithing to be your main source of income, you need to sit down and make a plan to get your name out in front of potential customers. Utilize the local media and also check into free local advertising options. Taking the time to reach out to potential and current customers can result in a sharp increase in business. Gunsmithing is a highly-complicated undertaking. It is important to ensure that you go about things the right way so you can ensure the safety of yourself and others, and build a business that can provide you with a good income. Take your time and do things right so you can enjoy what you do with no worries! Author Maggie O: Maggie began her writing career as a Public Affairs Specialist in the United States Air Force. She has held that job up to the present time, and has over 2,000 pieces of content published with her military byline, both in print and on the web. CC Images by PinkMoose thanks!